Not bad, right? I might call this ricotta and tomatoes on baguette a first cousin of the real dinner. And maybe I’d call this one a second cousin, which I might serve a toddler (or a pincer-grasping baby) who prefers his food equal but separate. This recipe has you tossing the aspargus in with the boiling pasta water which saves you a pot to clean. (You’re welcome!) 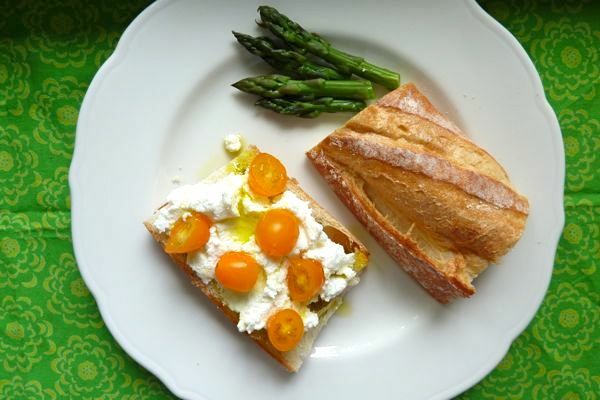 For Version 2 dinner: toast a baguette, top with ricotta and tomatoes as shown. Drizzle with olive oil and some good sea salt. Serve asparagus on the side. For Version 3: I think you got that one. Cook 1 pound pasta according to package directions. (We used cavatelli, but any kind will do.) While pasta is cooking, heat 2 tablespoons olive oil and 1 pat of butter in a large skillet over medium heat. Swirl a halved garlic clove in the oil just for a quick flavor hit, then remove. Add 1 1/2 cups chopped grape tomatoes (yellow or red), salt, pepper and cook until tomatoes are wilted. During last three minutes that the pasta is cooking, scoop out 1/3 cup of pasta water, then toss in 1 bunch asparagus spears (chopped) to the pot. Drain pasta and asparagus together and immediately toss in with tomatoes, cooking until pasta is coated with tomato juice. Serve with fresh Parm and chopped fresh basil. this looks so delightful! What type of pasta shape did you use? I just found your blog through the article in Bon Appetit. And am SO happy I did. Looks delicious. And seeing as how my toddler and my infant like things separated out…option three looks like it would be a hit in this house (at least with the younger set!). Jenny! I have lurked on your site for so long without ever leaving a comment. Why did I decide to comment today? Because when I went to decide what to feed my family for dinner tonight, I bypassed all the cooking magazines, cookbooks and other sources I consult and WENT STRAIGHT TO DALS. Without thinking about it. I realized you are truly now my main source for family dinner ideas. I hope this puts no pressure on you (never quit! please!) but instead gives you pride and satisfaction in knowing you made one harried parent’s life a little easier. Yes, this is a fan letter but I don’t care. You (and Andy) deserve one. Last one I wrote was to Shaun Cassidy (he was awesome too!) in 4th grade. Thanks for your hard work (and yes, I ordered the book- hope it comes soon! ), your blog is fantastic. My daughter, Anna, likes pasta as much as Abby. She wouldn’t touch the asparagus though, so we often have 1 dinner 2 or 3 ways. I would love Phoebe’s version for lunch. Both versions look delicious! Tomorrow is the day I go to the bookstore the moment it opens and buy your book. Can’t wait! I apologize that this has nothing to do with your post, but I just got an email saying the DALS book has been shipped, arriving tomorrow! I’m so excited! Congratulations and good luck. I’ve lived off this blog for a long time. This looks so good! Just wondering what you consider a ‘good sea salt’? Hey! I always wanted to comment but never got around to it. I just wanted to let you know that im singles and kid-less and LOVE dals!! I dont know if you have much of us, but this is also perfect for singles who work/study all day and come home at absurd hours and dont wanna spend $$$ on dinner, time on kitchen or empty calories on bad chinese delivery. I follow your site religiously, have a folder on my bookmarks just for your recipes and order the book already! I just got home at almost ten and was exausted and decided to go to bed hungry. Until i checked dals. 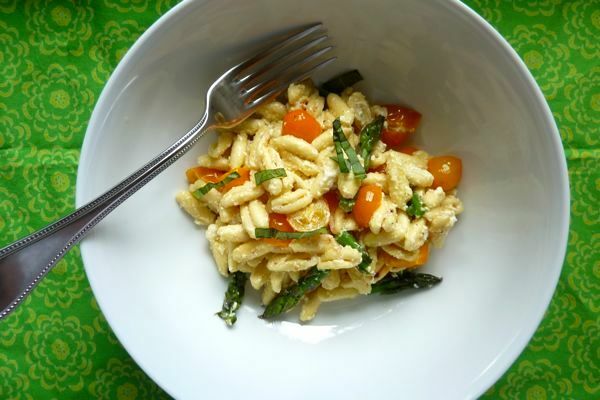 I just made this pasta (minus the aspargus cause i dont have them) in 20 min, and loved it! So thanks for all you do! Just thought you would like to know that even childless chicks get helped by you! I have a new found love for ricotta – I could not stand it growing up. Must try this recipe!! I just want to say that this pasta has become a staple over the past few weeks. It is so light, delicious and satisfying. Thank you for this awesome recipe! 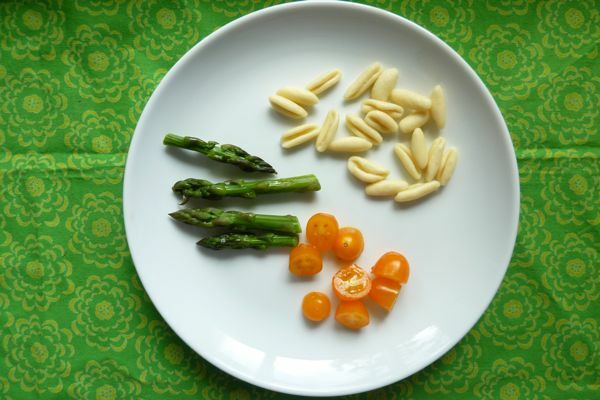 I have two children that love this meal, one who goes crazy for the asparagus and one who is thrilled with tomatoes. Thank you!